VM_365 Day 316 Roman pot lids. One size fits all? The image for Day 316 of the VM_365 project continues from yesterday’s post with our lid theme and shows part of an early Roman lid seated vessel from the Roman Villa at Minster. The post for Day 315 of the VM_365 project showed a rare Mid Iron Age lid used for slow cooking. Deliberately-made lids became much more common during the Late Iron Age (c.50 BC-50 AD) – and from thereon were a common item in Roman kitchens. However, the deliberate provision of rim top or inner-rim lid-seating, so that the lid rested snugly in place over what was cooking, mostly only occurs during the Roman period and from Medieval and Late Medieval times onward. 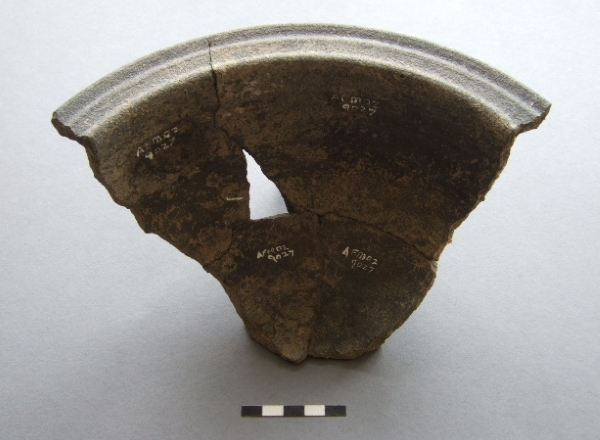 The example shown above is Early Roman and of a Canterbury grey sandy ware cooking-bowl made between c.100-150 AD. Although the rim is flat it has been provided with a series of grooves in order to receive a lid. This feature occurs regularly on contemporary cooking-bowls. The interesting issue is – why provide the rim with two grooves when one would do just as well? Is this to accomodate unavoidable productional irregularities in lid sizes or as a ‘help-meet’ to distracted or over-busy Roman cooks – when one lid will do as well as another? The images and information above were kindly provided by Nigel Macpherson-Grant. VM_365 Day 304 Tiny ceramic tazza, Roman temple near Margate? The image for Day 304 of the VM_365 project shows two images of a group of small ceramic vessels of a type that have been called tazza, a term derived from the Italian word for a cup. 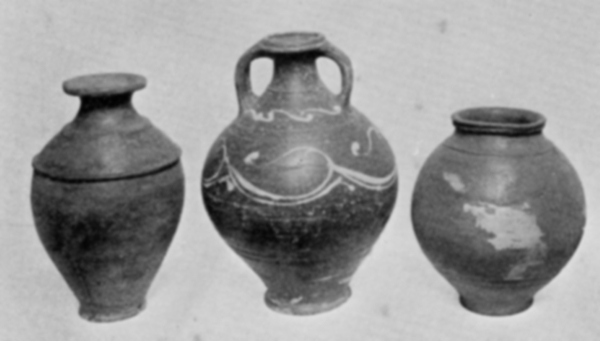 The image on the left shows the upper surface of the vessels, the right hand image shows the bases of three of them. 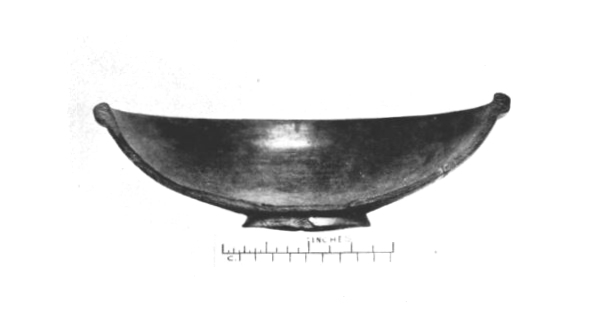 The term Tazza occurs in archaeological literature mainly in reference to elegant Late Iron Age and Early Roman pedestalled cups or goblets of Gallo-Belgic origin. The vessel design is ultimately stimulated by Roman originals and their British counterparts in Late Iron Age grog-tempered ‘Belgic’ style. The term tazzeti occurs less frequently but has been used in reference to the cluster of little saucer-like vessels shown in the images. Seven of these small tazzetti, complete or broken, were recovered from an excavation in the 1980s near the Sunken Gardens at Westbrook, which was led by David Perkins. The vessels are wheel-made. The image on the right shows the characteristic whorl, typical of many wheel made pots, on the upturned bases of three of the pots that show the whorls most clearly. The tiny cups are made in a sandy fabric, very similar to the products of many Roman pottery kilns in Canterbury made between c.75-175 AD. They fact that they are not very hard-fired suggests a likely manufacturing date between c.75 or 100-150 AD. But what were they used for? There is no certain answer. The small cups are a rare vessel type and nothing quite like these has been found in Thanet or the East Kent region before. 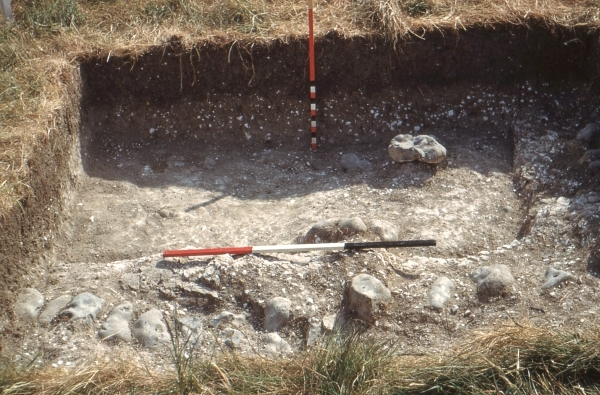 The only clues may lie among the finds associated with the cups which include several fragments of pseudo-marble wall facing and a small rounded quartz pebble. Perhaps the quartz pebble could is no more than an object picked up by a child from the beach nearby, but the rounded and semi-translucent nature of the pebble might have been considered ‘special’ by an adult. The occurrence of both the unusual little dishes and the pseudo marble seems altogether different and ‘special’. The ‘marble’ is not true marble, but is composed of broken fragments of genuine red and green marble deliberately added to a fine white mortar, which is polished so that the whole mix of small inclusions shines like genuine colour-flecked marble. A similar technique called Terazzo is still used to create wall and floor finishes. The marble finish suggests the presence of a building with a pretension to opulence, although the community was not rich enough to afford the real thing but had enough resources to have a reasonable facsimile created. In turn this suggests that the ‘marble’ fragments could come from the wall of a domestic shrine belonging to a fairly well-to-do family, or just possibly a public shrine or temple. The image for today, for Day 297 of the VM_365 project, is of eight sherds of Roman samian pottery , which were present in the collection of paper bags storing finds from a site archive from 1964. 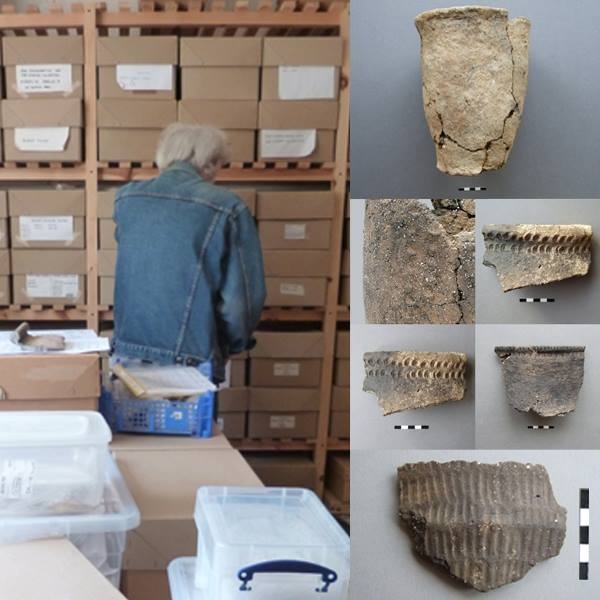 There are lots of types of pottery present in the archive box dating from the Iron Age and Roman periods and these will give us clues as to the nature of the site that was excavated there. 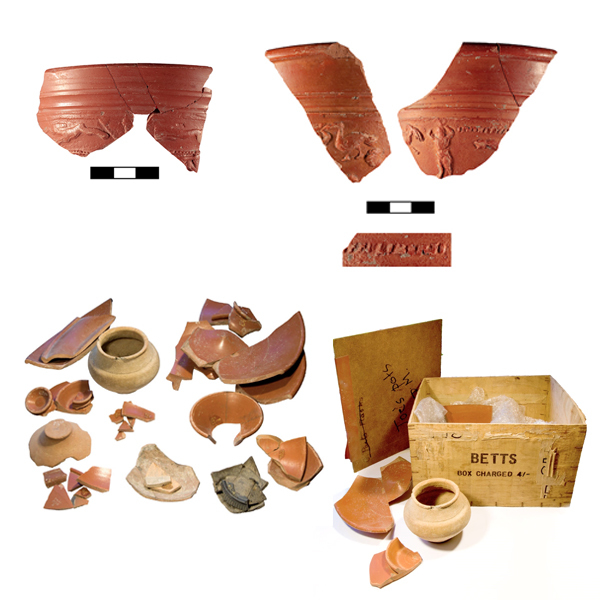 Yesterday’s post showed three sherds of Roman Mortaria, a distinct type of kitchen ware, from three different vessels. 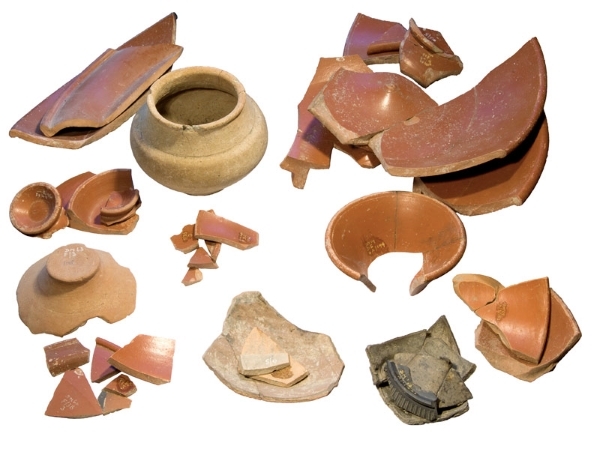 The imported high quality samian pottery above represents foot rings, rims and body sherds, mainly from plain cups and bowls although there is also one small decorated sherd. One of the sherds has a makers stamp reading ‘ERICIM’ impressed in the base (image right). Although re-analysis by a modern pottery specialist might bring to light up to date information discovered through research since the dig, the excavator was knowledgeable and had done some research identifying the potter as Ericus I, possibly from the Lezoux area of central Gaul and dating the sherd to between 80-120 AD. Examples of rare decorated samian sherds from the same region have featured on Day 175 and Day 179 of the VM_365 project.